Editor’s Note: This article complements Chris Colby’s article “The Many Ways to Weissbier” that appears in the January/February 2018 issue of Zymurgy. 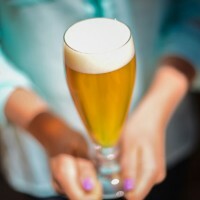 Arguably, the most interesting bit of chemistry relevant to brewing a wheat beer involves the transformation of ferulic acid into 4-vinyl guaiacol—the clove-like phenolic compound in wheat beers. (The chemistry related to ester formation, including the banana-like ester iso-amyl acetate, is the same as in “regular” ales.) 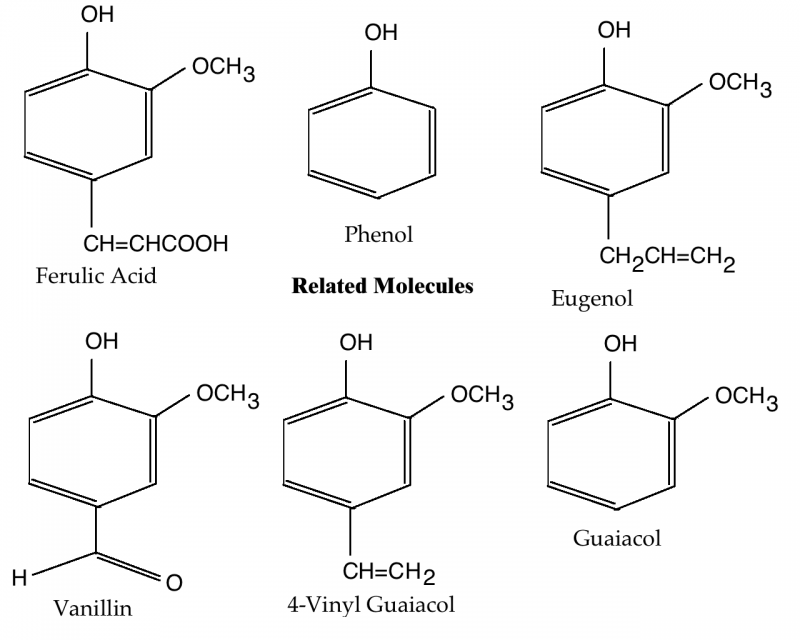 A brief look at 4-vinyl guaiacol production, and the structures of a variety of related molecules, is interesting and may be helpful to brewers looking to track the sources of off flavors when they appear. Phenol is a ringed molecule with a backbone of six carbon molecules and a hydroxyl group (—OH) attached to one of the carbon atoms. An interesting thing about phenol is that it is very reactive. It reacts with many molecules, especially those prone gaining electrons (electrophiles), in a way such that various chemical groups get attached to the ring. Phenols play many roles in brewing. Tannins are a type of polyphenol—molecules made of many phenolic sub-units. Some phenolic compounds cause off flavors described as medicinal, Band-Aid, and smoky. And, of course, 4-vinyl guaiacol is a phenolic molecule. Here’s a look at it, some similar molecules, and how they are connected. Ferulic acid and p-coumeric acid are both similar to phenol, but with a —CH=CHCOOH group at the fourth carbon. Ferulic acid additionally has a methoxy group (—OCH3) at the second carbon. Ferulic acid is the precursor to 4-vinyl guaiacol. It is found in the bran of wheat and barley and released during the mash, especially if the mash includes a ferulic acid rest. During fermentation, it is converted to 4-vinyl guaiacol by the enzyme cinnamate decarboxylase (also called ferulic acid decarboxlase). This enzyme is produced by yeast strains with an active form of the POF gene. These include wheat beer yeast strains, most wine strains, and also many wild yeasts. The same enzyme can also decarboxylate p-coumeric acid and produce 4-vinyl phenol. Decarboxylate means to remove a carboxyl group (—COOH). p-Coumeric acid is a molecule also found in the bran of wheat. 4-vinyl phenol is a minor flavor component in wheat beer. 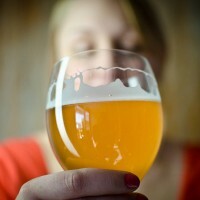 In normal beers (or wines), if present, it is likely due to contamination from Brettanomyces. By itself, 4-vinyl phenol lends a barnyard or mousy aroma, or a medicinal or Band-Aid-like character. 4-vinyl guaiacol is, of course, the most important phenolic molecule in wheat beers. As the chemical name states, it is guaiacol with a vinyl group (—CH=CH2) attached to the fourth carbon. Likewise, 4-vinyl phenol is phenol with a vinyl group attached to the fourth carbon. The enzyme vinylphenol reductase can reduce (add electrons to) vinyl groups attached to phenol and convert them to ethyl groups. This converts the double bond in the vinyl group to a single bond and two hydrogens “fill in the blanks” left by “open” carbon bonds. 4-ethyl guaiacol is described as spicy, clovy, or smoky (and perhaps even bacon-like). It is considered a desirable component in some wines. 4-ethyl phenol gives roughly the same off odors as 4-vinyl phenol and is considered a fault in wine. It is a component of some Belgian style beers, but it is unwanted in most brews. Eugenol and vanillin don’t play a role in wheat beer production, but their structures are similar to 4-vinyl guaiacol and they are also flavor-active molecules. Vanillin is an essential oil from the vanilla bean, and (of course) it smells and tastes like vanilla. If you were to change the methoxy group (—OCH3) on the fourth carbon, you’d have ethyl vanillin—a molecule that smells like vanilla, but is stronger than vanillin. 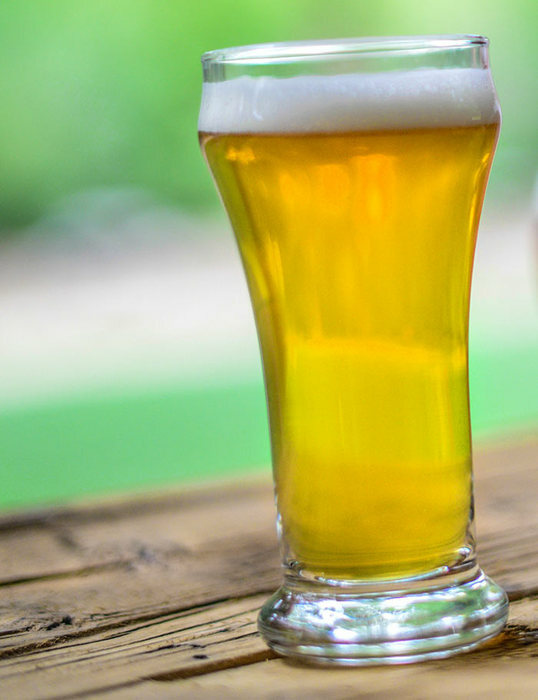 Wheat beers were brewed long before their chemistry was worked out. However, it’s interesting to see that so many flavor-active molecules that appear frequently in brewing share similar structures. 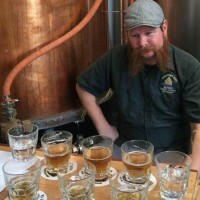 Chris Colby has been a homebrewer since the early 90s, when he studied molecular evolutionary genetics at Boston University. After receiving his PhD in 1997, he briefly worked in educational publishing before becoming a beer writer and editor. He is the author of Home Brew Recipe Bible and is currently editor of Beer and Wine Journal. He lives in Bastrop, Texas, with his wife and many cats.